A hop variety from the UK that has the aroma and flavor profile of an American one? How can this be? Well, these Brew Dudes are about to find out. I was contacted via Twitter by Ali Capper who runs Stocks Farm in Worcestershire, England. She let me know that they had a great harvest and that they had hops to purchase. When I went to their site, they had a clear call out to homebrewers to review their goods. They had nine different varieties to choose from but the one that I noticed right away was Jester hops. With measurements using the metric system and prices in GBP, I damned the torpedoes and bought some of these hops. The good thing is that the amount is enough to experiment with in a small batch before using them in a recipe for a 5 gallon batch. Origin: UK – from the Charles Faram breeding program. Their breeding program is based in Newland. Aroma/Flavor: The three main descriptors I found out there were aromas and flavors of grapefruit, lychees, and blackcurrant. The big test will be how much they differ from the some of the American varieties that have similar profiles like Legacy hops. Typical Usage: With its US-esque hop profile, I think this would be a good one for late boil additions. From the commercial examples that I have seen, it appears that they are definitely a flavor/aroma hop. Beer Styles: Pale ales and other hop forward beers. Certainly we will have more to report on these hops after they are shipped over the Atlantic to us. I am excited to be buying them straight from the farm that grew them. Once they arrive, I can update this post with an unboxing and then we’ll BIAB with them for a gallon batch or two. 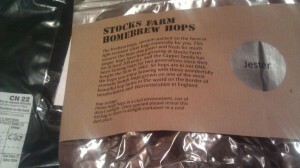 Thanks again to Stocks Farm for the head’s up and the chance to try out their hops. If you are interested, check out their site when you have a chance. It was very easy to buy from them using PayPal, especially with the conversion of US dollars to British pounds. Watch this space and Brew On. So how did it turn out? Can it compete with New World Hops? I just brew a SMaSH beer using Jester hops. We will have a tasting soon and reveal if they do compete! Hey Wilf!!! Check out the tasting video for the SMASH brew. Have you guys finally gotten a chance to make an beer with these hops yet? I’m looking for an alternative to the citra and amarillo I’ve used.